The city of Salzburg and its surrounding areas are best-known for being featured in The Sound of Music. The most famous film locations are the baroque Mirabell Palace and Gardens, the Felsenreitschule (Summer Riding School), and the Benedictine Nonnberg Convent. These sites are well-worth a visit, even if you’re not musically-inclined! 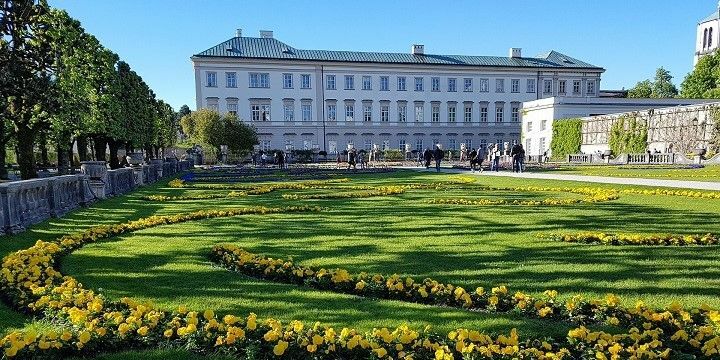 Mirabell Palace and Gardens is featured in "The Sound of Music". After taking a stroll through the quaint Old Town, head up to the Festung Hohensalzburg (Salzburg Castle), built in 1077, for a great view over the city. You can easily access it by foot, or via funicular. If NextStop24 helped you to choose your next travel destination, we'd be very grateful if you’d search for your accommodation and things to do in Salzburg through these links. They're affiliate links, which means that we will receive a small commission for every booking made through them. There are no extra costs for you; you'll simply be helping to keep NextStop24 running. Thanks! This city is a beautiful little gem on the Austrian border. At Christmas it comes alive with markets and winter food favorites. Quiet and family friendly. Great day trip from Munich, but wouldn’t recommend staying for longer. Walk up to the fortress rather than paying for the funicular and ensure you have plenty of time to walk around the old town! I visited Salzburg several times while living in Germany. I loved the tranquility of the city and gorgeous open surroundings. Visiting the old part of the city really feels like stepping back in time. Salzburg is a perfect city for a weekendtrip in Winter. There are a lot of nice litte markets, great food and the beautiful castle (covered in snow if you are lucky) You can wander around the little streets in the old town and do some window shopping for hours and then enjoy some mulled wine in one of the many nice cafés. Perfect for a day trip, especially if you love The Sound of Music! Worth going up to the castle/fort for lovely views.